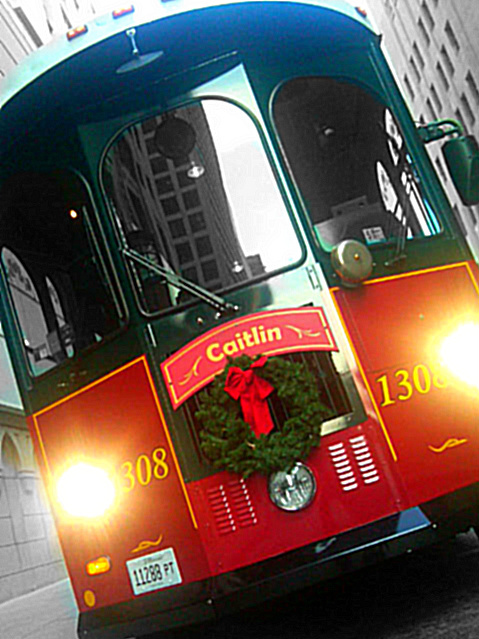 The Chicago Transit Authority is getting into the holiday spirit with our popular Holiday Train! Santa and his elves will ride the train passing out candy canes and season's greetings. The spectacular train is an amazing sight - during the daytime and at night. 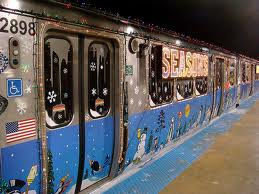 The outside of the six-car train is adorned with holiday seasonal images. Thousands of twinkling lights outline the shape of the train and windows, with even more lights running across the tops of the cars. Interiors of the cars are decked out with thousands of multi-colored lights, red bows, garland, and red and green overhead lighting. The hand poles are wrapped to look like candy canes. As the train pulls into each station, Santa waves to the boarding passengers from his sleigh on an open-air flatcar carrying his reindeer and decorated holiday trees. The Holiday Train also continues a 20-year agency tradition of supporting Chicago communities. Every year, CTA employees embrace the spirit of the holidays and donate time and money to purchase groceries and assemble food baskets that are distributed to community organizations across the city. This year, the requests increased to nearly triple the number of requests from 2010. CTA will donate approximately 300 food baskets to 30 local community organizations. Each food basket contains all the ingredients for a complete meal including a canned ham, potatoes, mixed vegetables, muffin mix, macaroni and cheese, fruit cocktail, green beans, corn and desert. The Holiday Train delivers the food baskets on three separate days over the holiday season. The Holiday Train will travel all CTA rail lines in November and December as part of regular rail service. Normal CTA fares apply. The train generally operates from about 1 p.m. to 8 p.m. on weekends and 3 p.m. to 7 p.m. on select weekdays (schedules for each rail line will vary), and will make stops at all stations along the respective routes. Click the title for The Holiday Train Schedule. Chicago Trolley Co is thrilled to announce that the popular "Holiday Lights Tour," previously available to groups only, is on-sale to individual ticket buyers. This seasonal tour will be available on Fridays and Saturdays through Dec. 23. CHICAGO - Chicago Trolley Co. is thrilled to announce that the popular "Holiday Lights Tour," previously available to groups only, will be available to individuals on Friday and Saturday evenings Nov. 25 - Dec. 23. Chicago's version of a caroling sleigh ride will whisk passengers amongst the festive lights and enchanting sights of wintertime in Chicago, including the twinkling lights of the Magnificent Mile, State Street & Macy's Holiday Windows, Daley Plaza's 40-foot tree, the John Hancock Plaza tree, Navy Pier's Winter Wonderfest, Buckingham Fountain, Christkindlmarket and more. Tickets must be purchased in advance and are only available online at www.chicagotrolley.com. The "Holiday Lights Tour" is also available as a private charter to groups, with a 25 person group minimum (32 person group maximum Trolley capacity). The Trolley will pick up passengers at any desired location in Chicago or the surrounding suburbs. Suburban pick-up/drop-off may incur additional travel charges. To book a Holiday Lights Tour as a private charter, please visit www.chicagotrolley.com or call 773-648-5000. Founded in 1994 with the idea that teaching actors and comedians to drive a trolley provides a better experience than teaching a bus driver to give a tour, this unique company has entertained and informed millions of locals and visitors on all-day sightseeing tours and private charter transportation including weddings, corporate charters, special event transportation, pub crawls, and more. With more than 70 vehicles, The Chicago Trolley & Double Decker Co. connects visitors to the best of Chicago's attractions, restaurants, shops, and entertainment. The popular tour and charter company has earned two Chicago Visitor's Choice Awards, including honors for Chicago's Best Tours/Transportation and for Best Service. The affiliated Stagecoach Group companies, including Coach USA and Megabus.com, also provide deluxe motor coach service to destinations throughout North America.